There are only a few requirements for you to become a fairy. First of all you need to actually believe in them. Sounds easy enough, right? We thought so too. Next you'll have to find yourself a wand, which can be a little difficult, but we're pretty confident we can help you out. After that comes the outfit. Really that one's pretty easy. All you have to do is be yourself and find what you can fly through the forest in without getting stuck in the brambles or anything like that. Then of course there is always the wings! It's very difficult to be a flying fairy without a lovely pair of whimsical butterfly wings for fast traveling all over the place! I believe there's one more...Oh! Of course it's very important in the fairy world to have a favorite color! What's yours? Could it possibly be purple? Well then we may just be able to help your little fairy dreams come true. 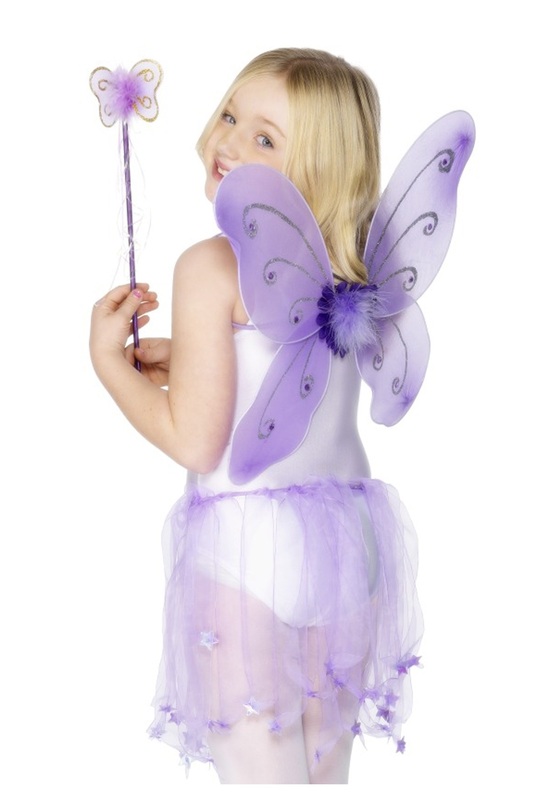 You'll look truly mystical with this purple butterfly wings kit that comes complete with a fantastic matching wand. It's perfect for playing dress-up with or even for a quick Halloween costume!